Work on improving oral ‪‎health for some of our youngest community members has been mentioned in this week’s Free Press Leader. 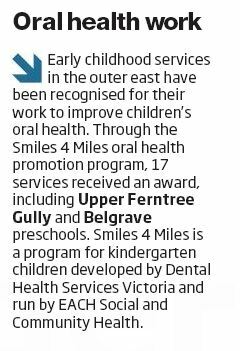 The Smiles-4-Miles program is developed by Dental Health Services Victoria and implemented by EACH in the Outer East. Read more about the service in the media release HERE.